Dorkbot in Chicago, Nov 28th. Liz McLean-Knight and Mike Una will be presenting at Dorkbot this month, which falls on Wednesday, November 28th ( Tomorrow ). As always, it will take place at the excellent Deadtech, 3321 W. Fullerton Ave. in Chicago, USA. A self-proclaimed “multi-hyphenate,” Liz McLean Knight–the sole woman behind Quantazelle–is thoroughly immersed in technology, fashion, music, and the often-surprising overlaps between. 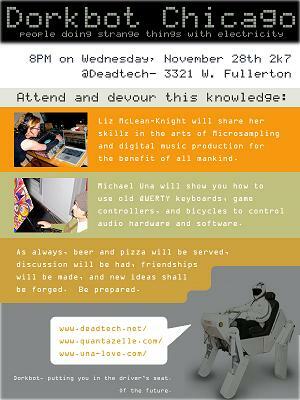 She will be demonstrating and discussing the art of “micro-sampling” and other swell digital music production techniques. Once she gets going, this whole thing might turn into a dance party. Michael Una an audiovisual artist whose work “investigates how vibrating waves of energy and human consciousness interact” will present simple-but-effective techniques for controlling audio software and hardware with inexpensive, commonly found devices like QWERTY Keyboards, video game joysticks, and bicycles. In addition to the knowledge, beer and pizza will be served. Yum Yum. Those who can’t make it, don’t panic. The event will be caught and released into the interewebs. Previous PostBent not Broken – Short Circuit Bending DocumentaryNext PostCirco Bazooko Explodes!